Record keeping for pest data will depend on factors such as the amount of data, technological savvy of staff, computing capabilities of the institution, etc. Record keeping can range from a simple list, an MS Excel spreadsheet, a custom database or sophisticated GIS tracking programs. The key is to develop a system that is sustainable with your institution’s resources and allows you to store and track the data in a meaningful way since even a single year’s worth of pest monitoring can wind up creating a lot of data. ZPest Tracker – an online tool that follows the IPM WG recommendations to track pests. This is a replacement for the original Zpest program. It runs cross platform on most devices. Zpest – This simple database for recording pest trap captures is available for free download. It runs on Windows XP – not recommended for newer OS’s. 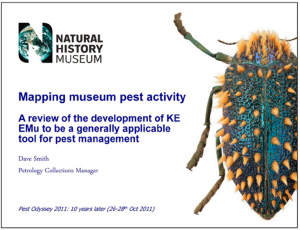 CollectionPests – is a complete online pest tracking program for museums, libraries, archives, historical societies and galleries that builds on the ZPest program with more features and capabilities. This program is offered by subscription service by Zaks software. The Database Field List document was created by members of the IPM-WG is to identify data fields that are most important for tracking pest observation data in a new pest database. The fields have been divided into four categories: mandatory, suggested, optional and not recommended. It must be remembered that every institution has different needs and goals, so as you design your database, your task will be to select the fields that fit your institution’s needs. There may also be fields not found on this list that you will want to include, but please remember that by keeping your database simple, you will increase its usability. 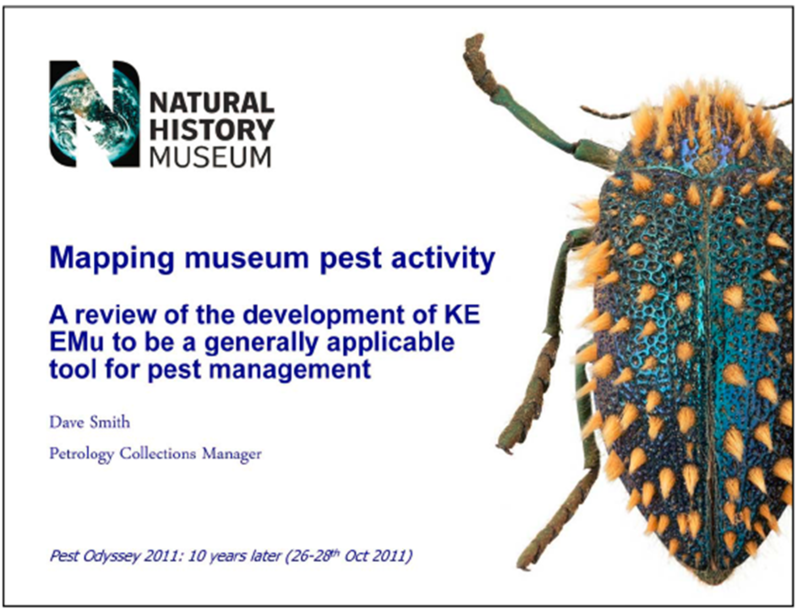 Mapping Museum Pest Activity: A Review of the development of KE EMu to be a generally applicable tool for pest management PowerPoint presentation given by Natural History Museum, London staff at the 2011 Pest Odyssey conference. What’s Inside the Building Envelope? 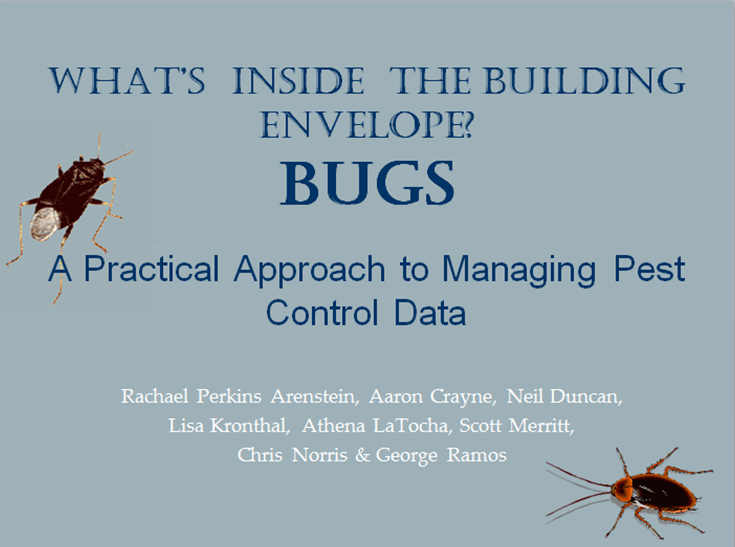 Bugs: A Practical Approach to Managing Pest Control Data PowerPoint presentation given by staff from the American Museum of Natural History and the National Museum of the American Indian, Smithsonian Institution at the 2003 Society for the Preservation of Natural History Collections Annual Meeting discusses the development of the Pest Manager Database program. 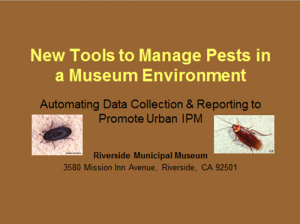 The Access database records and presents data from the museums’ IPM trapping programs. Additionally, the presentation outlines the search for bar code and scanning tools to speed data input. 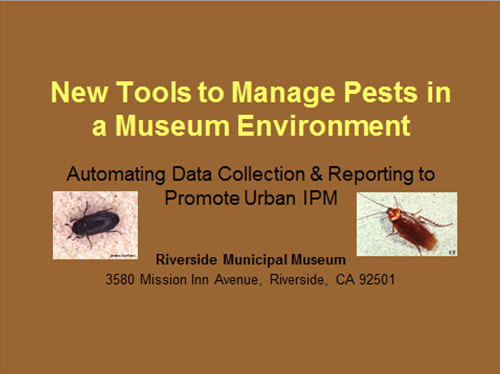 New Tools to Manage Urban Pests in a Museum Environment: Automating Data Collection & Reporting to Promote Urban IPM is a PowerPoint presentation given at the SPNHC annual meeting in 2004 in New York City, which examines the Riverside Municipal Museum’s use of new technologies in automating the pest monitoring process, facilitating the transfer of data and thus simplifying the practice of IPM. The Riverside Municipal Museum followed up their 2004 presentation with the poster A GIS Tool for Interpretation of Pest Monitoring Data in a Museum Environment that presents their work with graduate students from the University of Redlands in exploring ways in which Geographic Information Systems (GIS) technology can help automate important interpretive and analytical functions of museums. The Museum of Texas Tech University presented a paper entitled GIS as a Method for Improving IPM at the 2002 Society for the Preservation of Natural History Collections Annual Meeting. 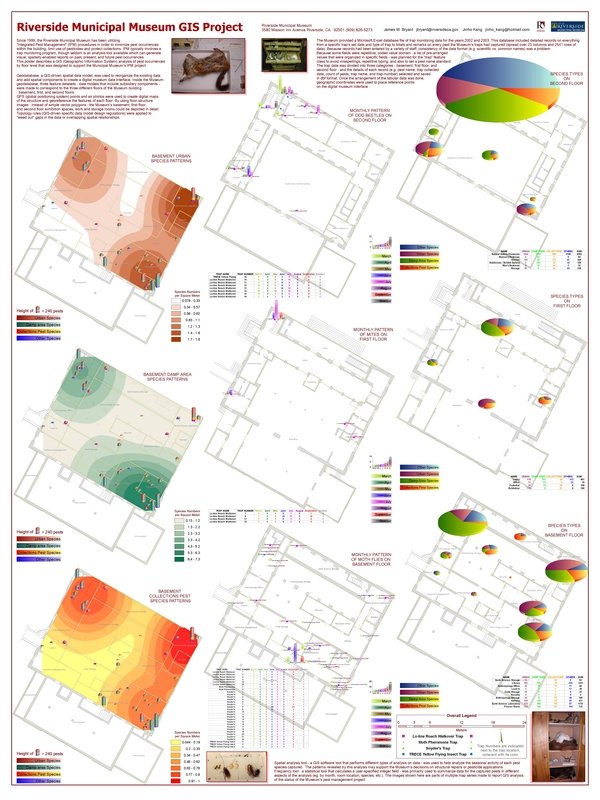 The paper discusses why an IPM program must include detailed and consistent records of all potentially harmful organisms observed in and around collection areas and how GIS can be useful in viewing the data to more easily conceptualize trends and/or potential or existing problem areas.